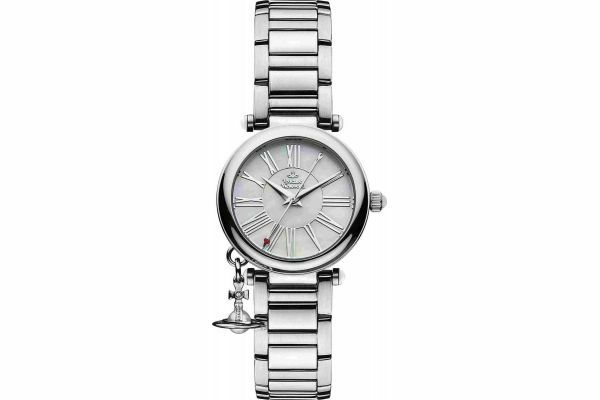 Elegant in its design, the Orb watch features a highly polished stainless steel bezel, 31mm round brushed case and faux white cabochon set crown. Striking with its iridescent white Mother of Pearl dial and accentuated with silver Roman numeral hour markers. The dial is beautifully emphasised by the silver batons and cupids arrow second hand, the Orb watch has been carefully crafted to ensure no opportunity for detail has gone amiss. A small silver Orb charm has been delicately attached to the watch case another detail synonymous with the Vivienne Westwood design. The elegant highly polished stainless steel link bracelet exudes sophistication and is completed with a hook and clasp closure. For us to size your new Vivienne Westwood Mother Orb watch as accurately as possible, please take a look at our downloadable Watch Sizing Guide.